Pill bags for storing jewelry, pills, toothpaste tabs, etc. They can usually be found in the drug store next to the pill boxes. Freezer weight ziplock for storing shampoo bars, electronics, and miscellaneous small things. The freezer weight bags are much stronger than the regular ones. 2 gallon bags used for washing clothing. These can be found in “big box” stores such as Target, Wal-Mart, K-mart, etc. Ultra-Light weight stuff sacks are great for storing loose items of clothing, such as underwear, socks, long johns, and scarves. Mesh wash bags can be used for organizing clothing or small items. They are available where ever laundry products are sold – even the supermarket! Nylon pencil cases are inexpensive and much lighter than the standard travel packing cubes. They can be used to hold makeup, electrical cords, jewelry, or odds and ends. The cases come in various sizes and shapes – flat, tubular, and rectangular. Look around for them at back-to-school sales. Sheet set containers can be recycled as packing cubes. Most of these zip shut. Sometimes the cube is see-through plastic, and sometimes it is made from the same material as the sheet. These cubes are great for storing underwear or clothing. Could you provide some photos and examples using these different methods? I am on the quest to travel lighter (and lighter) and I use a few small packing cubes right now (eagle creek 1/4 cubes three of them on my last trip), I am striving to cut and cut items. I can’t visualize how you would use some of these items as I’ve never used them. LOVE YOUR BLOG. I don’t have any photos at the moment. I usually use the stuff sack or laundry bag as my bundle packing core. I squish it into a rectangle shape for the core. I usually toss my electronics into a pencil case and put that on the side of my bundle. Zip locs of first aid & jewelry are put in my clutch and placed on the side of the bundle. The eagle creek items are heavy. I don’t use mine anymore because of that. Try Eagle Creek’s Specter products made out of a parachute-like material. This material weighs next to nothing. LOVE, LOVE it. I will not travel without these gems. My favorite is the folder. Mine is 12″ x 18″. I recently went to Grand Cayman using this product. I put 10 tops in here. The depth was probably 2″ because everything was folded the same size and the folder itself has four velcro-closing flaps to tighly secure/compress the items. An amazing product. I’m not a big fan of packing folders though. They add a lot of extra weight to the bag. I prefer bundle wrapping with 3-5 tops. Bundle wrapping won’t work for 10 tops though, as that is far too many for true light travel. Remember, the goal is not just to fit things into a carry on, but to travel lightly too! That means reducing and recombining clothing for many outfits. That’s why I am so happy with my Specter folder. Weighs nothing and I am really able to compress the stack with the four flaps! Yes. I just think it is better to take less clothing in the first place. Then I don’t need to compress it and I don’t need extra equipment to store it. I save several pounds that way. Each persons travel style is different and it looks like you found a product that works for you. pringles potato chip cans are super for holding small stuff, or lays being they are plastic. I can see using rigid containers if you are carrying fragile items. In general, soft containers waste less space as they can be stuffed into corners etc. We used mesh laundry bags for clean underwear and socks on a 12 week trip to E & W Europe. Worked really well- easy to see these items quickly. Also a big fan of ziplock bags of all sizes to reduce weight. Great for keeping dirty items separate! Lightweight drawstring fabric bags that come with some purchases are also great for shoes. I have small bins for storing useful containers I collect between trips for when I need to decant from larger containers.eg shower wash,shampoo. I often measure out the amount I usually use X number of uses expected + a bit extra. If I’m careful,this usually works perfectly. We hate having to top-up when away so planning is important to us. It looks like you travel a lot like I do! I keep all my toiletries pre-packed ahead of time and refresh after the trip. That way I’m always staged and ready to go – just add clothes! Many years ago, as a kid on family vacations, I would use the little zippered bags from the Beanie baby line. Me and my sister had several and I would steal hers to add to my packing organization. I still have a couple that I still use even now for packing. They’re pretty much exactly the same as packing cubes with the added pro of the top being clear. I also used the clear zippered sheet bags. And occasionally settled for plastic grocery bags. Even as little mini-me, I was serious about packing. Now, I still am, and I still much prefer reusing and finding alternative uses for ordinary things. I like the concept of packing cubes, but the prices have put me off. Right now, I use ziparound plastic cases (similar to linen containers, but much smaller. They came with bras and underwear I purchased online.) I also use two rectangular makeup cases (1 small, 1 medium) instead of cubes. They work just as well and don’t take up that much space. I put socks and underwear in the small ziparound cases, T-shirts and leggings in the small makeup case one, and pants, long-sleeve shirts, and longer items in the medium one. For toiletries, I use the 3-1-1 ziplock or one of the small plastic zip around containers. Everything gets rolled. 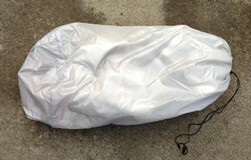 Clear plastic bags from the dry cleaner are also good for larger items like dresses, blazers, etc. Zippered sweater storage bags are also a good alternative. Instead of buying pill bags, I use the little button bags that come with new clothing! I seem to have a variety of sizes that work for everything from allergy pills to Q-Tips!